With these seasonal snowflake candles on your tables you'll have a touch of winter's frosty charm inside. As dramatic as the season they so aptly represent, these winter snowflake candles are a standout among favors for all winter and holiday occasions. Each features a metal base with a wire snowflake design decorated with glistening rhinestones at each of its points and at its center. Resting in the base is a frosted glass votive sized candleholder. Each is 2.75" tall and 2" round and comes packaged in a white gift box with a tea light included. I needed to buy a dozen inexpensive but lovely gifts for everyone in my ladies group for Christmas. These little silver candle holders are the perfect choice. They are small but elegant looking and include a real wax tealight and a white gift box. The candles were very cute that I ordered but more than 3 came broken and that made everything a mess for my daughters party as I couldn’t get new ones in time for her party according to the company. Unfortunately the way things worked out. I bought these as favors for a Christmas Tea, and they are lovely. A perfect light above the place settings, and a simple take home for my guests. Appreciated the careful packaging. All arrived safely. Received my order for 250 candles on the date promised. Using these for Christmas Tea favors. Love them. We bought these for a wedding January wedding favor. They were beautiful and perfect for the occasion. Everyone loved them. The candles are even nicer than I expected! I'm so happy I bought them for my wedding favors!! This favor will be perfect for my daughter's Winter Wonderland theme wedding next month. Nice Price Favors had the best price, the quality we were looking for, and a timely delivery. Would recommend. These votives are really cute and look just as nice in person as they appear in the photo. There was an issue with some stones missing in a couple of votives but they were replaced in a very timely manner. Good quality and came on time- perfect for a small favor. I put this with the snowflake coasters on this site wrapped in a cute favor bag! Guests loved them. Wasn't expecting such a quick delivery which was a plus. I also wasn't expecting candle to be delivered with the holders which was a another plus. The item looks just like the photo and that is what I paid for at a great price I might add which was also a PLUS. 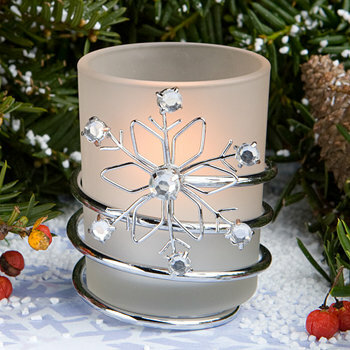 These snowflake votives look exactly like the photo. We replaced the piece of hard wax for a real candle. Couldn't be happier! The candles were great. We set them up at our holiday party at our clubhouse. We substituted flameless candles instead of the wax ones. They were on the table as favors for people to take home. We lit the candles and lowered the lights. It looked great. It would be nice if flameless candles were offered instead of wax. Ordered the candles for holiday gifts. They came 2 days later!! Super fast. The candles themselves are very beautiful and look sturdy. They are not cheaply made and I am really happy with them. I will definitely be ordering from this company in the future. We were amazed by the quality of this product. The metal was solid and sturdy. The snowflake and glass are beautiful! We saw the same product on other sites for double and triple the price so we were afraid these would be poor quality. But that just is not the case! Very impressed! Super impressed with nicepricefavors.com also. Fabulous customer service and everything was packaged nicely. Received quickly! The candle holders came quickly and looked beautiful! The base is nice and sturdy and stays remarkably cool. My only complaint were the wax candles that come with these holders. Super cheap, blackened the holder, and smelled awful! I would definitely recommend buying other candles to put in these. Otherwise, great product!